Dr. Otto Warburg was the man who discovered the cause of cancer, he was awarded the nobel prize in 1931 for his work. Initially it was my understanding that he discovered cancer but he actually discovered the cause which in my opinion is even more valuable than discovering cancer. Many people have recognized a problem, a disease, a tumorous lump growing on someone and labeling it a disease. The cause of that disease is even more important and relevant than the disease itself if you want to do something about it. 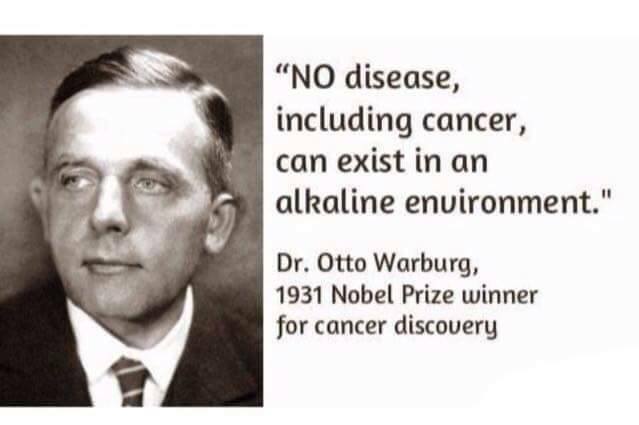 His work came to be known as the “Warburg Effect” or the “Warburg Hypothesis” which basically entailed that cancer cells live off sugar (glycolysis) and that they also thrive in an anaerobic environment. These causes lead me to believe the opposite would help to reverse the cancer growth. What do you think? His discovery led him to certain conclusions. These conclusions that he was led to may be true or false to you but i’m going to leave that up to you to decide. I trust this man (the discoverer of it) more than the American Cancer Society or any other medical organization though because he’s worked to get to a place of excellence and understanding of cancer. Large organizations that take your money for a ‘cure’ or to walk around in a circle wearing pink shirts haven’t done a whole lot with the BILLIONS of dollars poured in for research. Believe it or not Dr. Otto Warburg also wrote a book entitled “Cancer: It’s cause and it’s Cure ” which blows my mind. I recommend listening to the recent interview on my podcast with Ty Bollinger as well as reading the Top 6 Cancer Prevention Foods. Cure for cancer has been found however the US government will never allow it to be widely known or available. It’s a matter of economics. The “symptoms management” business of cancer creates hundreds of billions of dollars in annual revenues and if the disease was eliminated would put thousands of hospitals, research firms etc out of business. Unfortunately it’s just that simple. Fruits contain sugar, but are alkaline. Should they form a diet to fight cancer or not?